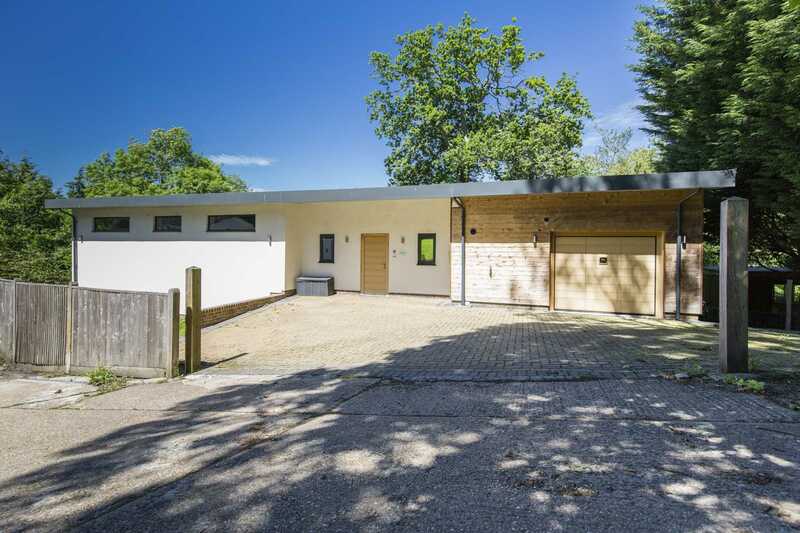 SOLD BY FLYING FISH PROPERTIES Tucked away on a quiet private road surrounded by woodland, the crisp and contemporary appearance of this home as your approach is quite modest. Once inside, however, its beauty, scale and impeccable design are immediately apparent and take your breath away. 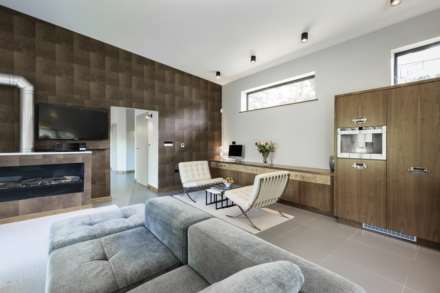 Sleek and elegant with an ergonomic use of its substantial space, this home certainly delivers a luxury lifestyle customised to suit family needs. The high-quality finish is flawless with designer lighting and tiles seamlessly linking one well balanced room with the next while the whole house is warmed by underfloor heating. 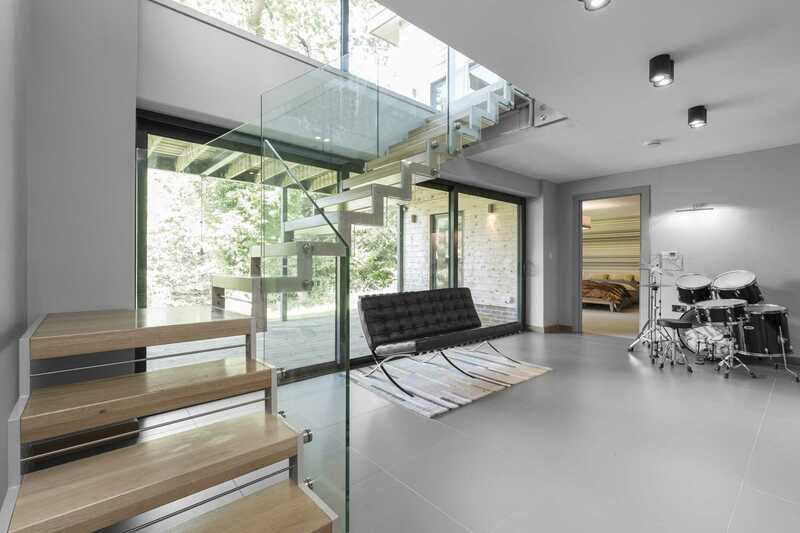 A solid oak front door entices you into an immaculate entrance hall, its polished Porcelanosa tiles gleaming with light from a wall of glass that merges the home with its leafy landscape. A useful guest cloakroom, large separate utility room and an additional storage room, perfect for muddy boots and coats, run off the entrance hall. To the right is a wonderful sitting room which is flooded with light from its triple windows overlooking the garden and glazed bi fold doors which give direct access to the sun terrace. 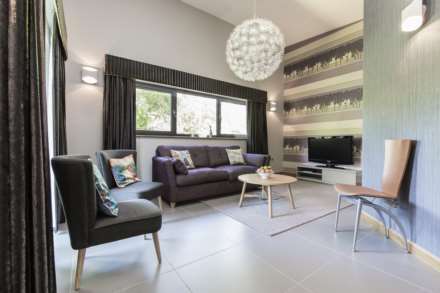 It is a welcoming space with a high ceiling and underfloor heating to create warmth in the winter months as you curl up in a deep sofa. At the opposite end of the house is the jewel in this home`s crown, the fabulous open plan living, kitchen, dining room. 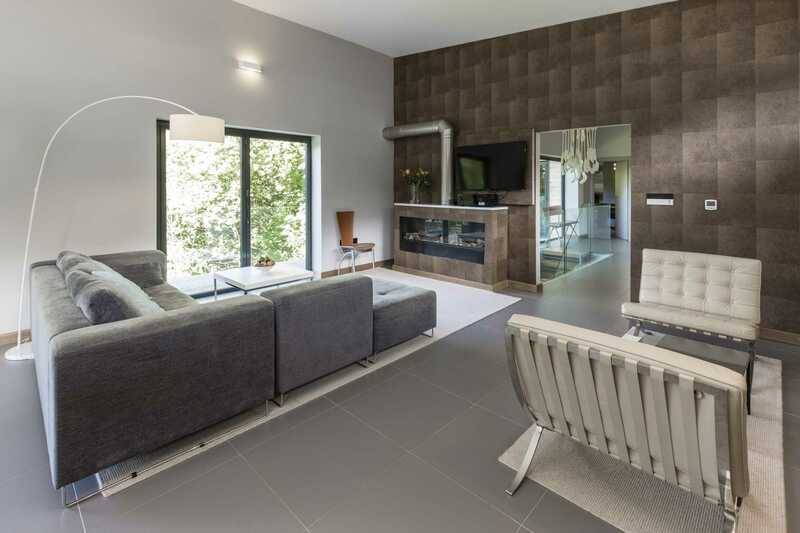 It really is a show stopper both in terms of its impressive size and creative design with two sets of bi fold doors effortlessly extending the living space onto the sun terrace. 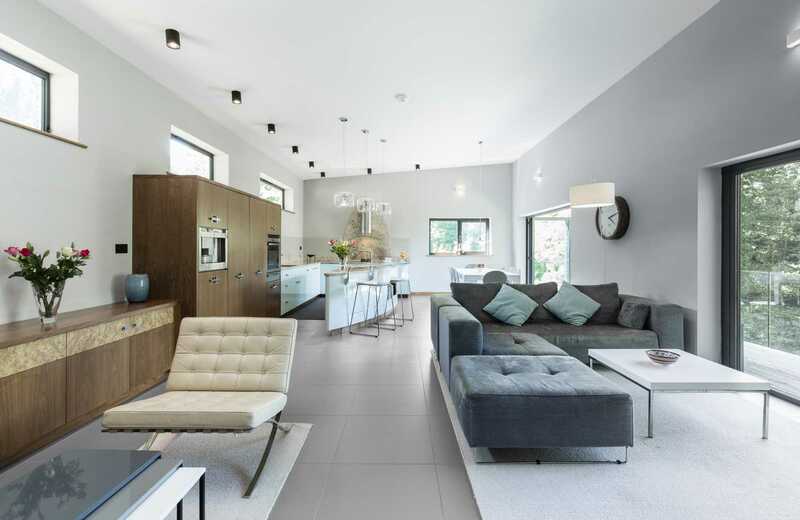 The dimensions of the living space cleverly define a dining and seating area with ample space for a deep sofa and a large dining table and chairs. A contemporary remote-controlled gas fire sits in front of a striking feature wall at the back while a wall of bespoke walnut mid height cupboards link the study area with the kitchen. The luxury Simon Bray kitchen at the rear of the living room is a visual delight with its mix of bespoke walnut and poplar cluster and pale turquoise high gloss lacquered cupboards. A sumptuous curved island topped with a raised glass breakfast bar sits above a gleaming granite work surface. It is a cook`s dream with all the high end integrated appliances that you would expect from a house of this quality including a NEFF oven, coffee machine and induction hob and a Bosch dishwasher. 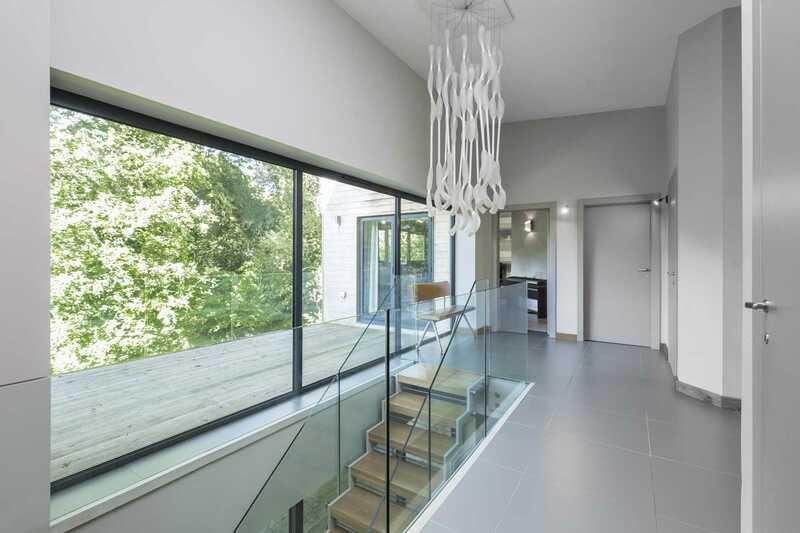 Returning to the entrance hall a beautiful contemporary staircase with oak treads and glass balustrades winds you downwards to the lower ground floor showcasing the home`s contemporary, light filled interior. The fresh modern feel of the upper floor continues throughout this floor with an open family room offering more versatile living space. A set of bi fold doors open directly onto the decking at the rear bringing the outside in offering comfort and play in equal measure as you are warmed by the sun. The magnificent master bedroom suite at the far end of the hall offers a wall of windows with an additional glazed door allowing you to lie lazily in bed delighting in the spectacular tree top views. A contemporary, modern en-suite and bespoke walk in dressing room, both add to the feeling of luxury that the room certainly delivers on. Two further generously sized bedrooms and a third with its own beautifully finished en-suite offer superb family accommodation. The immaculate family bathroom completes the floor. With decking wrapping round the length of the house on both floors you have plenty of alfresco dining space and room to lie lazily in the sun. The garden is lush and green sloping down towards the woodland behind. Mature trees, hedging, plants and shrubs afford great privacy enabling you to enjoy the pleasures of the countryside tranquility the home enjoys. This is a home that sits discreetly in its landscape yet delivers architecture that is bold and atmospheric. 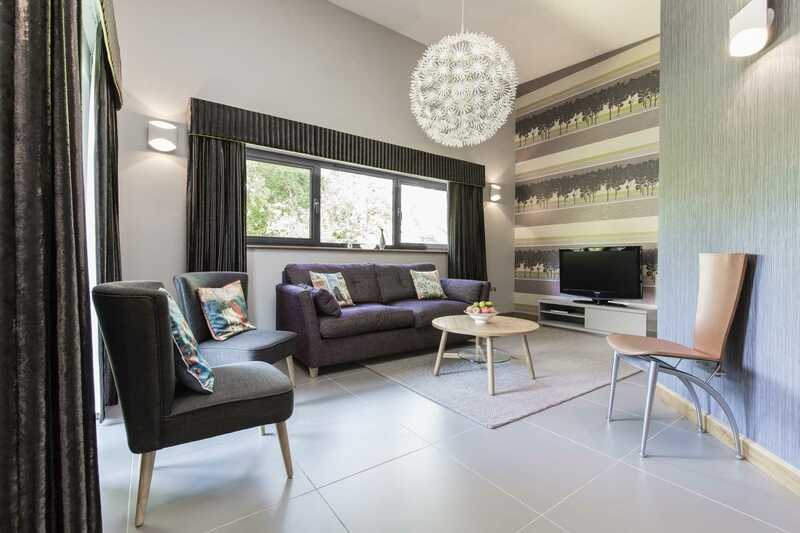 The current owner`s desire was for light, space and a connection with the outdoors and they have certainly achieved their aim. Her attention to detail has ensured stunning décor and fittings of the highest quality throughout. 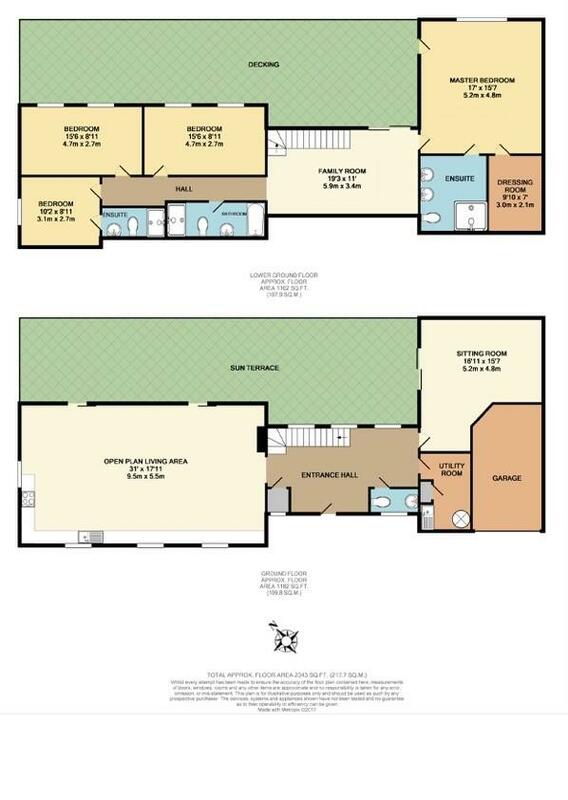 It really does offer a luxury family lifestyle that you could move straight in and enjoy. A must see! Cloakroom: Front aspect double glazed window, round shape free standing one piece pedestal hand wash basin with mixer tap over, concealed cistern WC, Porcelanosa tiled walls, polished Porcelain tiled floor with underfloor hearting and digital underfloor heating control panel. Utility Room: Space and plumbing for washing machine and dryer, fitted slimline tall housing cupboard, butler sink with mixer tap over and cupboard under, fitted wooden unit housing water tanks, megaflo water cylinder with controls, wall mounted Worcester combination boiler, polished Porcelanosa tiled floor with underfloor heating and digital underfloor heating control panel. 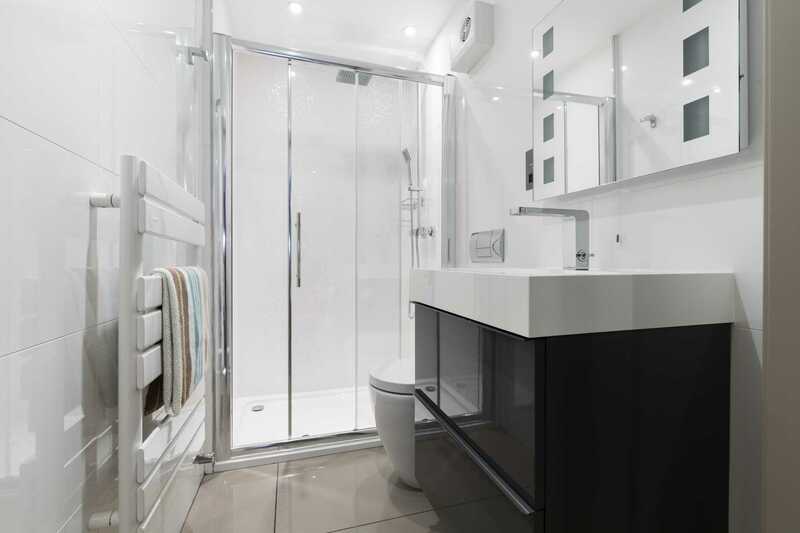 Storage room: Front aspect double glazed window, fitted shelving and hanging rails with space for coats, polished Porcelanosa tiled floor with underfloor heating and digital underfloor heating control panel. Sitting Room: 16`11 x 15`7` Triple rear aspect double glazed windows overlooking the rear garden and woodland beyond, folding glass door to the side giving access to the decking, ceiling speakers and wall speaker points, polished Porcelanosa tiles with underfloor heating and digital underfloor heating control panel. Kitchen/Living/Dining Room: 31` x 17`11` Two sets of rear aspect double glazed bi fold doors overlooking the garden, triple front aspect double glazed high windows, side aspect double glazed window, 3 double bespoke Simon Bray mix of walnut and poplar cluster mid height cupboards with internal shelving, remote controlled gas effect fire with flue, ceiling speakers, polished Porcelanosa tiles with underfloor heating and digital underfloor heating control panel. The Simon Bray kitchen cabinets are a mix of walnut and poplar cluster and pale turquoise high gloss lacquered cupboards with pan drawers, extending pull out corner units and a pull-out bin. The granite work surfaces have an inset stainless steel 1 ½ bowl Franke sink with mixer tap at the rear while a granite topped curved island with pan drawers under and a raised glass breakfast bar providing seating for bar stools has an inset stainless-steel bowl sink with mixer tap over. Integrated appliances are NEFF oven, warming drawer, coffee machine and induction hob with 4 halogen rings and 1 central gas wok buriner ring with glass and stainless-steel extractor fan, a Bosch dishwasher, fridge and freezer. 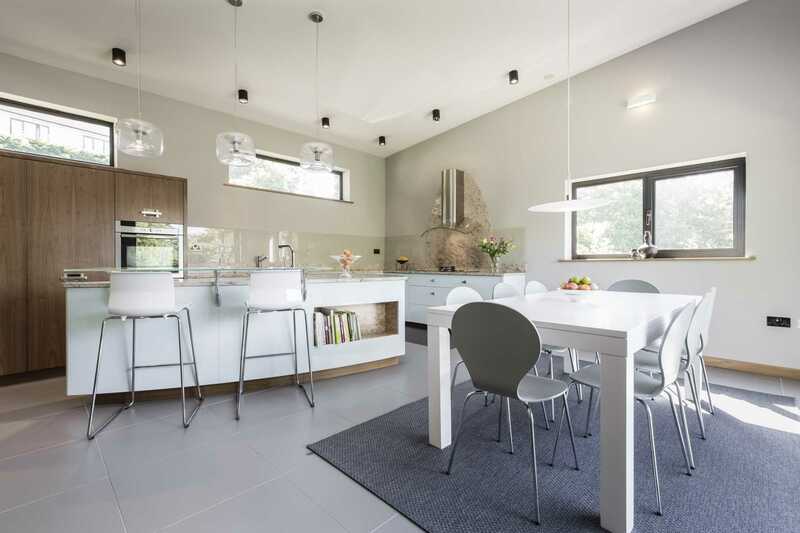 There is plenty of room for a table and chairs at the far end of the kitchen and the room is a wonderfully light and airy space, perfect for relaxing and entertaining in. 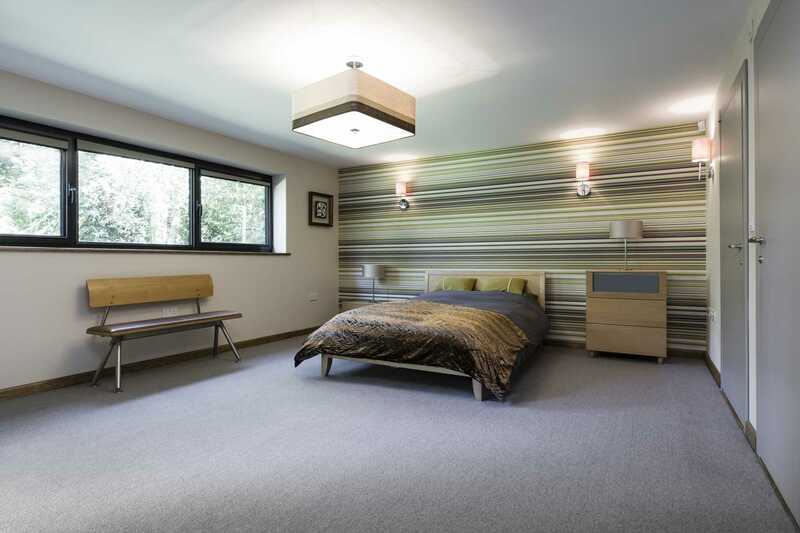 Master Bedroom: 17` x 15`7` Triple rear aspect double glazed windows with integrated blinds providing views of the garden, glazed door giving access onto the decking, underfloor heating and digital underfloor heating control panel. 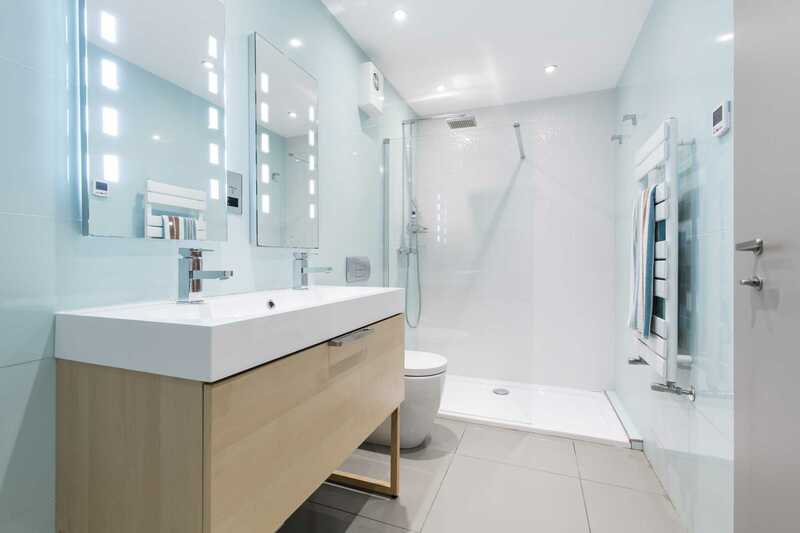 The dressing room has Ligne Roset open fitted shelving and hanging rails and wooden effect Porcelanosa tiles with electric underfloor heating. The master bedroom`s spacious en-suite has a large walk in Teuco Steam Cabin Hydrotherapy shower cubicle with overhead rain shower, hand held shower attachment, hydrotherapy jets, chromotherapy lights and radio. 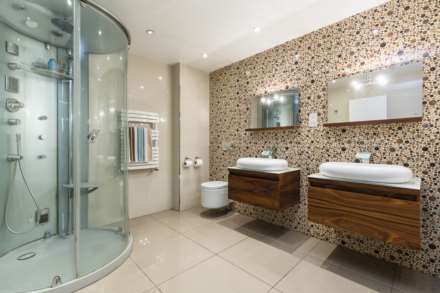 There are two wall hung wooden vanity units with glass tops and ceramic wash hand basins with mixer taps over and pull out drawers under, Porcelanosa tiled walls, polished Porcelanosa floor tiles with underfloor heating and digital underfloor heating control panel, concealed cistern WC and heated towel rail. Bedroom 2: 15`6 x 8`11` Rear and side aspect double glazed windows with integrated blinds overlooking the garden, underfloor heating and digital underfloor heating control panel. 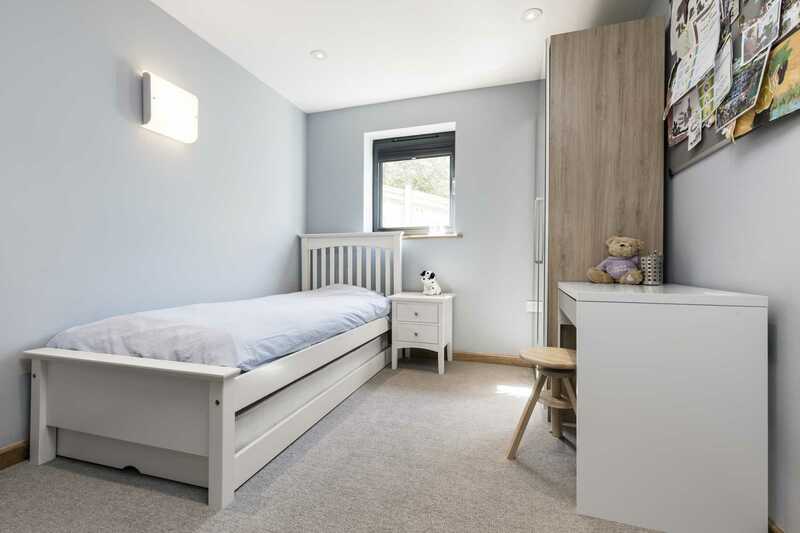 Bedroom 3: 15`6 x 8`11` Rear aspect double glazed windows with integrated blinds overlooking the garden, underfloor heating and digital underfloor heating control panel. Bedroom 4: 10`2 x 8`11` Side aspect double glazed window with integrated blind, underfloor heating and digital underfloor heating control panel. Bedroom 4`s spacious en-suite has a large walk in shower cubicle with wall mounted shower head, wall hung hand held shower attachment, wash hand basin set on top of vanity unit with drawers under and mixer tap over, Porcelanosa tiled walls, Porcelanosa tiled floor with underfloor heating, concealed cistern WC and heated towel rail. Family Bathroom: Mosaic tiled panel enclosed bath with mixer tap and hand-held shower attachment and mixer tap over, double vanity unit with wash hand basins with mixer tap over and pull out drawer under, walk in wet room shower tray with glass screen enclosure and wall mounted shower head and wall hung hand held shower attachment, low level WC, Porcelanosa wall tiles, Porcelanosa tiled floor with underfloor heating and heated towel rail. 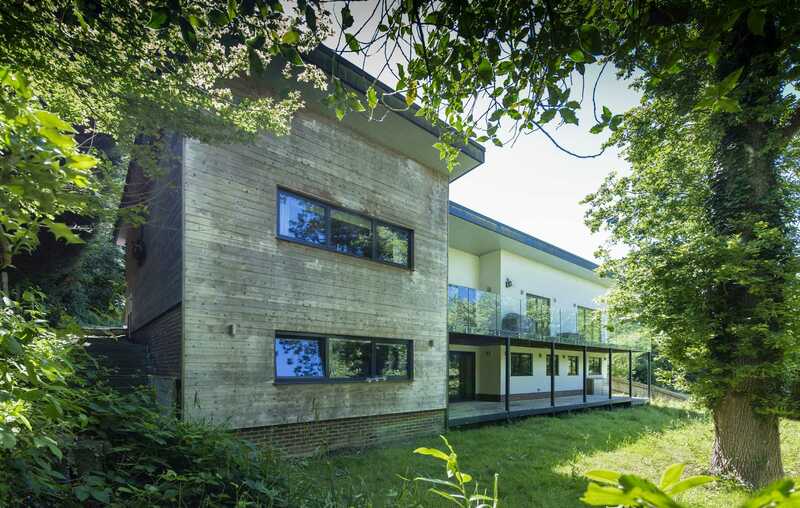 Outside: The house is approached via a no through drive at the bottom of Argyle Road to a private block brick driveway providing parking for several cars and an attached garage with a Silvelox steel framed oak up and over door with separate pedestrian door, a raised mezzanine level, electricity and lighting. A mid height wooden fence runs around the left of the front of the property with an area of lawn behind giving access through to the rear garden. A front water tap and block brick steps to the right of the house lead down to the rear garden, making it accessible from both sides. 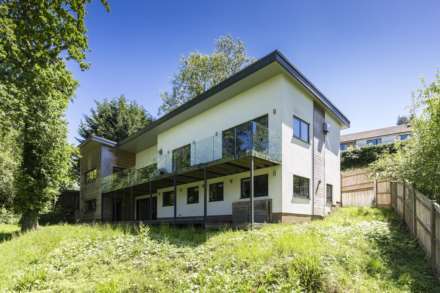 The grassy rear garden slopes downwards to the wooden perimeter fencing and mature trees, shrubs and hedging merge it with the woodland landscape behind. The home also enjoys upper and lower wooden decking stretching the width of the house which is enclosed on the upper deck by frameless glass balustrades. It is perfect for alfresco dining in the sun whilst the garden itself, a blank canvas to design to your own needs, graciously slopes downwards to meet the woodland beyond. Southborough Common, situated towards Argyle Road`s end of the village, is a conservation area where cricket has been played for more than 200 years. Excellent secondary, independent, preparatory and private schools can be found in both Tunbridge Wells and Tonbridge, while Southborough and Bidborough have their very own primary schools. Argyle Road is also within the catchment areas for the 5 highly regarded and sought after Tunbridge Wells and Tonbridge Grammar Schools.